If you feel that it looks like something you know then, you are perfectly okay. If not then you need to see THIS or THIS. Its seems like all lipsticks will start to come in this crayon form. I am in love with crayon form but there is nothing LADY-LIKE in that. Please continue to bring lipsticks in the normal bullets that we love and our grandma used to love. 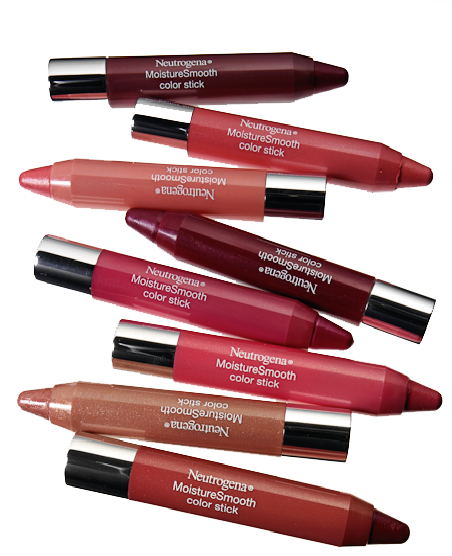 NEUTROGENA MoistureSmooth Color Sticks instantly moisturize lips, while continuously conditioning them so they are softer and smoother in just 3 days with nothing on them. Made with fruit extracts along with mango and shea butter, the balm-like formula glides on easily, providing a sheer wash of moisturizing color that lasts for hours. In addition, the twist up package allows for perfect application each time – with no sharpener needed. They are priced at around 8$ and are not available in India. The revlon just bitten ones which were for 4$ in US are for 600 INR so, I really dread the price when these come here. I keep reading everywhere that the Revlon kissables are priced $4 in the US. But actually they are priced $8.99 in the US. I got mine for 4$ from ebay. Even the other offers are around 4 to 6 $. Actually the US to India price hike is quite high and disheartening :( revlon stain balms - $4:Rs.600, revlon lip butters - $6.5 - Rs.650.